It is still raining out my window as it is up and down the Mississippi. There is justified awe and fear of the power of that great river, which channels the flow from 31 states. A very great deal of that brown water goes past beneath the Memphis bluffs and it is rising to levels not seen since 1937. One of my sunday school class members told yesterday of that great flood which covered much of eastern Arkansas. He was 17 at the time and remembers his high school closing so that it could be converted to emergency shelter for people driven off their land by the water. On saturday I road in a fundraising bike ride for diabetes (the tour de cure). The 35 mile route wound from riverfront splendour though industrial grit and then in neighborhoods on the edge. Their homes were financially “under water” with lots of foreclosure signs block after block. And now non-metaphorical water rising up the walls of the mobile homes in the bottoms, heading for the streets nearby. Humans are vulnerable people, needing each other to make it in ways and means that we don’t expect. The radio and TV shows know they can draw a crowd with bombast and mean-spirited silliness about individual responsibility replacing government. 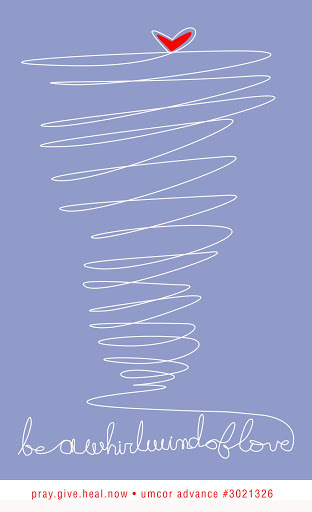 But in real life where it rains, floods and ever now now and then swirls with F5 tornado force, it takes all kinds of responsiblity–personal, social, faithful and government. Collins Dillard is an artist of abnormal sense and sensitivity. The picture is a poster he did for our little United Methodist Church, St. John’s, to tell us how to send money where it will help somebody immediately and efficiently. The United Methodist Committee On Relief (UMCOR) has a stellar record moving fast and smart with compassion and competence. Just google UMCOR Advance 30021326. Send money. And prayers of gratitude that we are made to connect. The other pictures are of a kind of sculpture Collins did that went along with the poster. 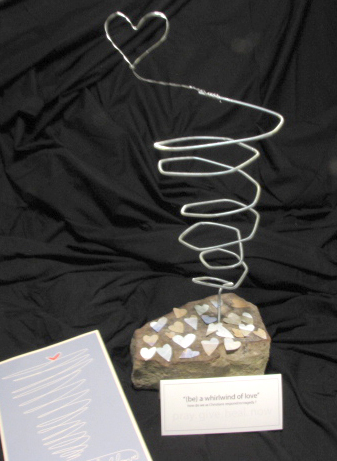 The bent wire spirals up out of a stone toward a heart. 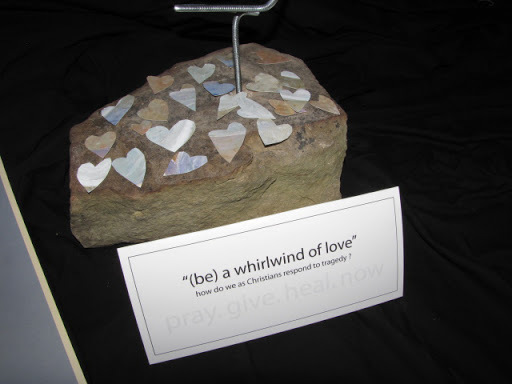 We were encouraged to come, pray, place a paper heart at the base signalling the prayer and the intention to help.